Summary: A golden opportunity for Jim and Pam to prank Dwight arises when Dwight asks Jim to form an “alliance” to find out about downsizing rumors. Meanwhile, in order to boost moral, Michael puts together a surprise (and very early) birthday party for a co-worker. Boosting Moral: Rumors of downsizing are floating around the office, so Michael wants to boost moral by having an office party. He decides to have a birthday party for Meredith, despite her birthday being weeks away. Michael struggles to come up with a quip for the birthday card, and settles on a rather humorless joke about “downsizing your age”. An Alliance? What does that even mean? : No one feels more left out of the office gossip than Dwight, so he asks Jim if he would like to form an alliance in order to gather information. Jim, seeing a golden opportunity to prank Dwight, agrees, and spends the day giving Dwight bad information, as well as convincing him to spy on the warehouse by hiding in a box. Michael Scott: Philanthropist When Oscar asks for donations for his nephew’s walk-a-thon, Michael pledges $25, not realizing it’s per mile. Michael attempts to change the pledge, but after the birthday party fails to lift anyone’s mood, he decides to announce his sizable donation to appear like the “good guy” to his employees again. It’s just office pranks: Jim lets Pam in on his “alliance” prank with Dwight, as uses it as an excuse to talk and scheme with her all day. At the end of the day, Jim tells Pam he thinks he’s convinced Dwight to dye his hair and go undercover at a different branch. They giggle and are getting a little too close when Roy walks in. After Roy gets in Jim’s face, Jim tried to explain the “alliance”, but Dwight denies it ever existing. “I think Jim learned an important lesson” Dwight says to the camera (with dyed blond hair). The “Teamwork” Medal: Jim and Pam are great partners in crime as spend the day coming up with bad information and fake meetings in order to convince Dwight that there are alliances all over the office. The “Party Planning” Medal: The is the first time we see the Party Planning committee in action, and we can already tell Angela is a bit difficult to work with. Dwight: It’s a real shame, ’cause studies have shown that more information gets passed through water-cooler gossip than through official memos. Which puts me at a disadvantage, because I bring my own water to work. Angela: I think green is kind of whoreish. Pam: This was tough. I suggested we flip a coin. But Angela said she doesn’t like to gamble. Of course by saying that she was gambling that I wouldn’t smack her. Dwight: Do you want to form, an alliance, with me? Jim: OK, listen, we need to assume that everyone in the office is forming an alliance and is therefore trying to get us kicked off. Dwight: God… Damn it! Why us? Jim: Because we’re strong, Dwight. Because we’re strong. Dwight: I’m a deer hunter. I go all the time with my dad. One thing about deer, they have very good vision. One thing about me, I am better at hiding than they are… at vision. Jim: Wait, this isn’t gonna work. The lid’s open. Dwight: So tape it down. Jim: I can’t do that. You won’t be able to breathe. Dwight: Look, I can breathe just fine. OK, but if it makes you feel better, I’ll poke holes in the box. Jim: Thank you, thank you. 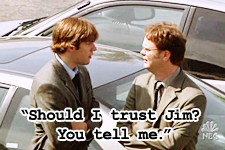 OK.
Dwight: Can I trust Jim? I don’t know. Do I have a choice? No, frankly, I don’t. Will I trust Jim? Yes. Should I trust Jim? You tell me. Dwight mentions Meredith has won “multiple Dundies” which we later learn are the annual office awards. possible continuity error: in this episode it’s mentioned Meredith is an accountant, but later in “Halloween” it’s stated there’s only three accountants: Angela, Kevin and Oscar. There is a brief shot of the staff newsletter about the “80′s Party.” There is some amusing filler text, and apparently all future newsletters have this same text. future reference: In “A Benihana Christmas” (3.10) Phyllis mentions that Angela thinks green in whorish. Angela replies that “orange” is whorish. foreshadowing to future episodes: Jim mentions there’s a Dunder Mifflin branch in Stamford, which he would transfer to at the beginning of season 3. The flan behind Flonkerton and forever Office trash.